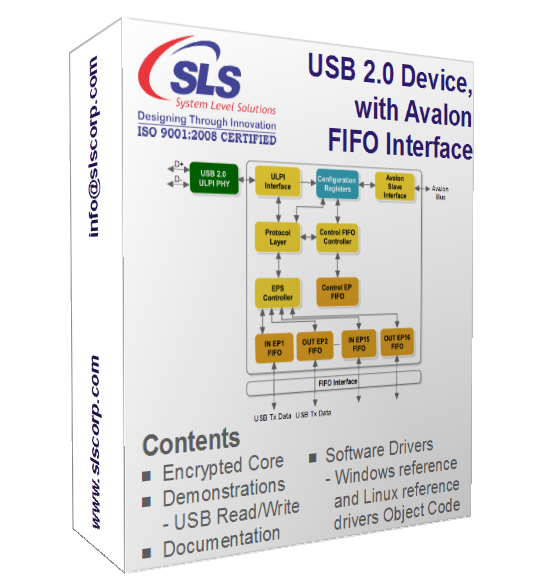 The USB 2.0 Device, Software Enumeration FIFO interface (USB20SF) IP Core is a FIFO based USB 2.0 device core with 32-bit Avalon interface and ULPI interface support. The core supports both High Speed (480 Mbps) and Full Speed (12 Mbps) functionality. The core supports three preconfigured endpoints - Control, Bulk IN and Bulk OUT. It can be configured for up to 15 IN/OUT endpoints on customer's request at additional cost. Each configurable endpoint has an endpoint controller that supports interrupt, bulk, and isochronous transfers. The core has been optimized for Altera FPGAs and its functionality has been verified on the hardware with Altera Quartus II. The package includes ModelSim precompiled library for core simulation and verification. *Low speed (1.5 Mbps) support also available on special request, contact support@slscorp.com for more details.